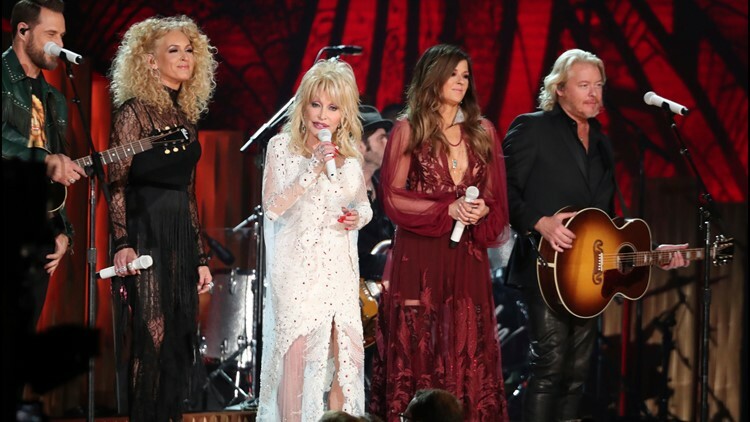 Dolly Parton, center, Jimi Westbrook, from left, Kimberly Schlapman, Karen Fairchild, and Philip Sweet, of Little Big Town, perform "Red Shoes" at the 61st annual Grammy Awards on Sunday, Feb. 10, 2019, in Los Angeles. It was a star-studded tribute for Dolly Parton, but the country music icon outshined everyone else on stage at the Grammy Awards. It was a star-studded tribute for Dolly Parton, but the country music icon outshined everyone else on stage at the 61st Grammy Awards on Sunday. After she was honored as MusiCares Person of the Year on Friday, Parton performed some of her biggest hits at the Grammys, including "Here You Come Again," "Jolene," "After the Gold Rush" and her hit "9 to 5." She also performed a newer song, "Red Shoes," that debuted last year as part of Netflix’s movie "Dumplin'." Wearing a white dress with a billowing cape, Parton was joined by her goddaughter Miley Cyrus, Katy Perry, Kacey Musgraves, Maren Morris and Little Big Town. After her stunning performance of "Red Shoes," the crowd gave Parton a standing ovation, and she encouraged them to keep standing for "9 to 5." Some celebrities in the crowd sang along. Parton was the first country musician to be named the MusiCares Person of the Year. "I truly am honored to be the MusiCares Person Of The Year and the first country artist to be honored," Parton said during Friday's celebration. "I can truly feel the love in this house tonight ... it's a long long way from hills of East Tennessee to the Hollywood Hills, but it has been a wonderful journey." 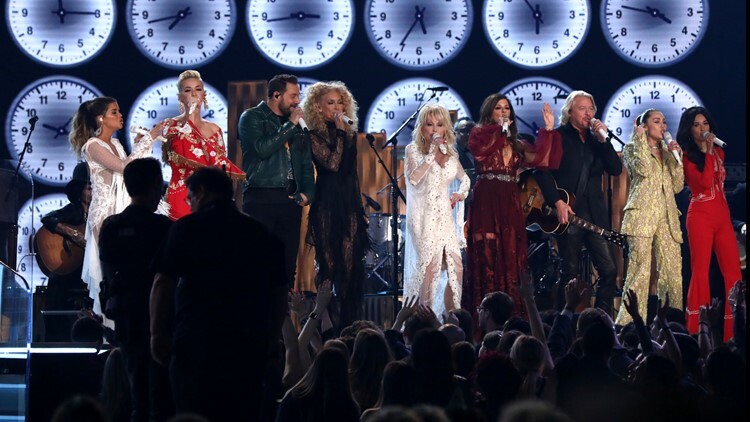 Maren Morris, from left, Katy Perry, Jimi Westbrook, Kimberly Schlapman, Dolly Parton, Karen Fairchild, Philip Sweet, Miley Cyrus and Kacey Musgraves perform "9 to 5" at the 61st annual Grammy Awards on Sunday, Feb. 10, 2019, in Los Angeles.